Most of Gray’s research comes from Toronto newspapers, so she is also diligent in identifying the various editorial prejudices of the time, and when possible, identifies and describes the individual reporters. In the Davies case, this also leads to interesting points about the emergence of female journalists in Toronto at the time, particularly as Davies was tried in the Toronto Women’s Court which banned men (and thus male reporters) from the viewing gallery. Indeed women’s history emerges as a major motif in the book, as do a dozen other intriguing historical topics. As a general rule I tend to be wary of true crime books; the subject matter is always depressing, and the people involved are often portrayed either as salacious figures ripe for retrospective gossip, or as inhuman specimens to be prodded with detached interest. Fortunately, Gray’s work is sensitive and tasteful. Gray’s attention to detail often makes 1910s Toronto look incredibly unrecognizable through today’s eyes, yet you never forget that Carrie Davies, Bert Massey, and everyone else involved were real people with real feelings and real fears. Although Gray includes a convenient “List of Characters” near the beginning like a golden age mystery novel, you never think of these people as abstract, fictional playthings. 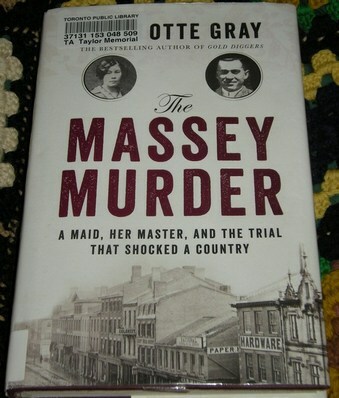 The Massey Murder is extremely well-written, both in its prose and in its structure. While I find it a very compelling read, I think its chief strength lies in the way it connects so many different threads of society. Too often, public historians like to write narratives as if our subjects live in isolation. We make a person or organization or event into a hero, and everything else seems only to serve the hero’s purpose. If there is a protagonist in this book it might be Toronto itself, with all the people and organizations breathing and pulsing in support. But, of course, even Toronto is not in a vacuum. Throughout the book, Gray inserts repeated reminders about the ongoing First World War, which influenced the media coverage and which infiltrated the rhetoric delivered by the lawyers at trial. If I have a criticism of this book, it is that I would prefer proper endnotes, rather than the general source notes at the back. While I have no reason to doubt her research, I enjoy seeing superscript numbers following facts, and like to spend my time flipping back and forth between the main narrative and the “bonus features” in the back. Gray has opted to put the detailed notes on her website rather than in the book itself. (I suspect this keeps the cost of printing down.) This arrangement is unlikely to present a major problem for future researchers looking at the Davies case itself, as they should be able to follow the timeline of events in the old newspapers, and Gray usually indicates her main sources within her text. Researchers seeking to track down details on a side topic Gray mentions, however, may be frustrated in future years if this information is no longer available online. I should disclose that I had an extremely small part to play in the development of this book: the author and I exchanged e-mails some months ago regarding the renaming of some streets in Toronto. I am not sure how helpful I actually was, but she was gracious enough to include my name in the acknowledgements, which gives me a nice, warm feeling. That said, I certainly would recommend this book for anyone interested in cultural history, and especially to those looking for insights into what Toronto used to be like. This entry was posted in Book Review, Crime History, Women's History. Bookmark the permalink.